It was the most amazing experience of my life! 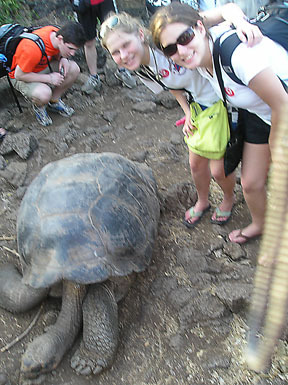 I loved every minute of it and was "galapagos sick" for a week after. It was a group of 17 kids and 3 chaparones. Two are married science teachers, the other an assistant prinicpal. There were 5 girls and 12 boys. First we flew to Quito and spent 2 nights in a hotel and traveled to the Otavalo market. After that we flew to the galapaos where we spent a week on our own private yacht with a crew of 10! Every morning we woke up at about 7:30 and had breakfeast. Then we would start out on a hike where we would learn about the land and the animals. We would come back on the boat for lunch, usually have a little bit of rest time and then we would go out again in the afternoon. We snorkled everyday and swam a lot. We snorkeled with many turtles, sea lions, fish, and even sharks! We would come back on the boat for dinner and have class at night. Every day was jam packed yet we never felt rushed, and we always learned so much. We all became so close and still hang out frequently at home. It was deffinitly one of the best things I have ever done in my life! I highly recomend it! We made a shutterfly site where we have 3,000 pics up. Go to shutterfly.com, click on the member sign in tab, sign in with the email adress chaimo123@aol.com and password hill. Under "My Recent Albums" you can just view mine (Katherine's Album), or over on the left, click on "View all albums."